Did think the 800 was a bit different, don't think I've seen one before. Well it arrived, and I'm very happy. 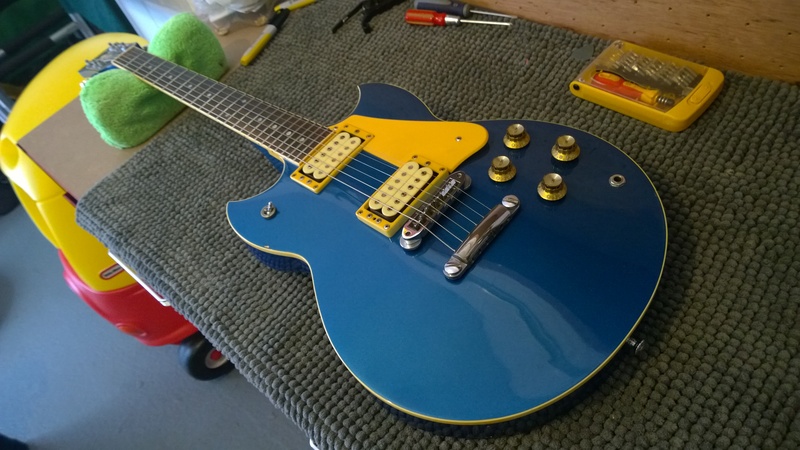 The blue is lovely the guitar plays great, is in good nick for a nearly 40 year old guitar... Happy Dez. Very nice! That's a beaut. Seems it lost it's somewhere along the way, maybe someone on OSG has a spare? That looks great. I prefer the D+B ones. That's the best NGD I've seen this year. Well done. Quite envious, I must say. Dots and binding. I much prefer these without the big inlays and with the plain tops. Yours is one of the coolest I've seen. Aye, not a fan of overly fancy inlays either. The larger inlays on Yamaha SGs are amongst the most tasteful in my opinion, I really like them. But that doesn't detract anything from this, it's a fine looking guitar as it is. Again, aye the large Yamaha inlays are one of the nicest ones. (What's the neck depth like on yours, anyhow?). Been playing this all evening and just remembered it has coil taps... Fancy push button ones. The split neck pickup is a wondrous sound fat but not too bassy. Good point. Where would I take the measurement from? Back of the neck to the front of the fretboard - squint through a shatterproof ruler is my preferred method. I have the callipers I shall check later.